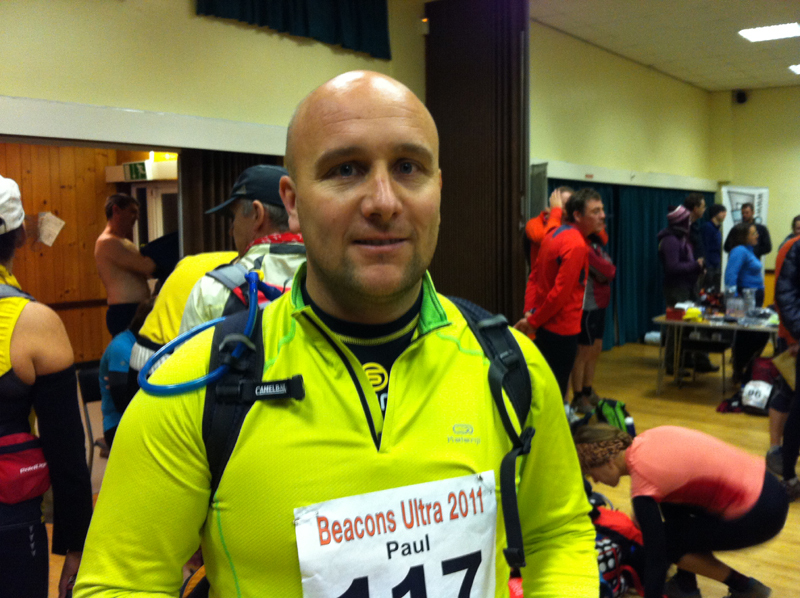 Stouty and I took part in the 2011 Brecon Beacons Ultra organised by Likeys. We travelled to Talybont the Friday evening with Colin Lee and registered the night before enjoying a meal in the White Stag Pub and retiring for the night prior to our early (7.30am) start the next day. We arrived at Henderson Hall the next day at around 7am, spoke to a few people and made the last minute adjustments to our kit prior to the start. There was an extensive list of compulsory kit (hat, gloves, map, waterproof tops/bottoms, first aid kid, water, food, space blanket, head torch, spare batteries and a whistle) although we did pretty well to fit all of this into our camelbaks. The only real sacrifice we had to make was the volume of food we carried but since we normally take too much and I left my For Goodness Shakes powders (a personal favourite) in my kit bag for the end. So ultimately, what we carried proved to be the right amount. We had debated what to wear and carry particularly as the required kit asked you to take a fleece top (or something equivalent). Ultimately we both decided to wear a base layer and a mid-layer and forgoe a running vest. We also had a rain jacket packed if we wanted an extra layer for warmth. The race organiser Martin gave the pre-race talk and health and safety briefing before we made the short walk to the canal path for the start of the race. The race was to follow 2 laps of part of the Brecon Beacons and finish back at the start location at Henderson Hall which was the Race HQ. Stouty, Colin and I lined up at our traditional places at the back of the grid before we set off. The first few miles of the race is flat and follows the canal path for 3 miles and we overtook a number of people on the way before settling into a group of around our pace before heading up Beacons Way towards Tor y Foel summit about 5 miles into the race. The summit was hard work with pretty much everyone we saw reduced to walking this section. As we got higher and higher, visibility was reduced due to the cloud/mist to now more than a 100 feet or so all around you in the front. I had suffered with a back injury 3 weeks ago forcing me to totally miss a few days of running and I had only just got back to “comfortable” running in the last week and I could really feel the effects here. We made it to the summit and then headed down the other side and got back into a running rhythm. There was a good descent which we ran although the footing was a little tricky before reaching a long path and gentle incline for a couple of miles. We bumped into Mimi Anderson who was having an off day (we probably would never have seen her at all to be honest during a normal day) and had a brief chat before continuing on. We passed the first checkpoint although didn’t really stop at any of these on the first lap. 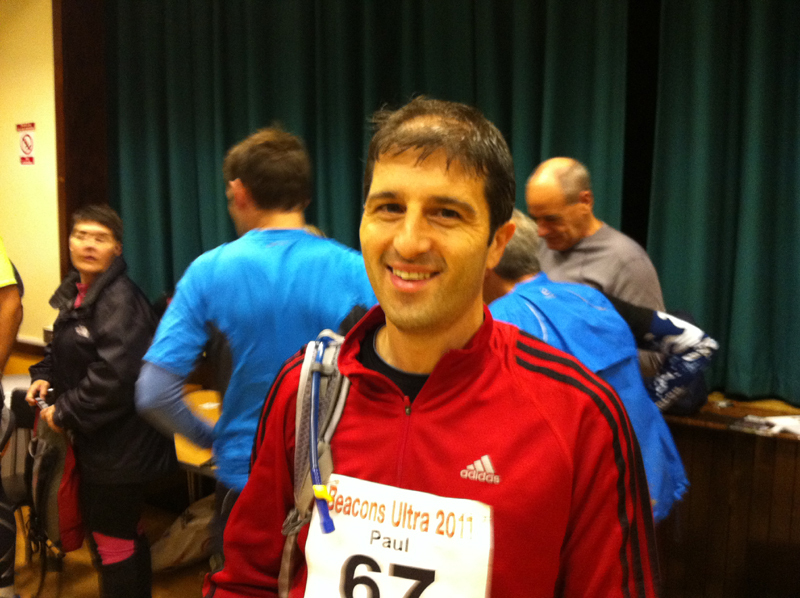 The race was advertised as minimal support so no food was expected at checkpoints but there were water supplies. One comment I would make is that whilst there was water on offer to fill up hydration packs/bottles it would have been good to have some paper cups to get a drink aswell. On a couple of occasions I filled my hydration pack and then also took a drink of water from the bottle. The next section I recall was another long gradual incline across a very stony path which made running freely difficult as you carefully navigated your way over the path and I did stumble over a couple of times but managed to avoid a true ”face-plant” effort. We arrived at the second checkpoint but just carried on down a really tricky path (again more loose rock and difficult footing) but did our best to trot down the path. The route was well marked and we didn’t have any navigation difficulties at all on the day. Marshalls were in place at any key points on the first lap and a few remained in certain places on the second. The next part of the route I recall as being a lot of downhill, certainly there were some sections where momentum seemed to get the better of you and you started to pick up the pace whilst trying to maintain your balance and footing on tricky ground. We followed this downhill stretch for a while before arriving at more country lanes which made running a lot easier and eventually passed through a village (Pencelli I believe) and then back onto the canal path where we started. My water supply ran out a mile or so from the halfway point and so Stouty and I decided to take on some more food at that point and refill our hydration packs. We arrived at the half way point and took on some more water and decided to walk and eat for a little while. We had heard there were about 40 or so people ahead of us leaving perhaps a 100 or so behind as I don’t think we had the full complement of starters. The flapjack I had packed went down well and after attending to a small blister on the sole of my left foot (not helped by the wet conditions underfoot) and then ran the rest of the canal route before heading towards the summit for the second time. I wasn’t really looking forward to the hill and struggled up this second time round. Physically my legs felt fine, my feet were ok and I wasn’t out of breath but mentally it was a real challenge to get yourself going and I resorted to the take 30 steps, pause for a few seconds, take 30 steps etc. I really didn’t enjoy the hill at all second time round. However, as soon as that was out of the way the rest of the race seemed like no problem at all and we soon started plodding down the other side of the hill. I would say that visibility was worse second time round perhaps reduced to 50 feet but the track was well trodden meaning we found the path relatively straightforward to follow. My back hadn’t really troubled me second time around up the hill but I had taken an ibuprofen earlier so perhaps the discomfort was dulled by the pain killer. Stouty did point out to me that my running style had looked a little awkward and I seemed to be carrying the back a bit which I hadn’t really noticed myself so perhaps it was a subconscious effort to minimise the discomfort. Around the 30 mile mark, Stouty had his moment of weakness as he lost all motivation to run for a while. I offered to sing for him to get him going (he declined) and then resorted to simple motivational goals (lets run to that next marker we could see ahead) to get a run/walk effort going. At this point we met up with Jessica who was last years lady’s winner. Unfortunately, she was struggling with a few injuries and had decided to pull out at the next checkpoint. We walked with her for a little while before we found some kind supporters who gave her a lift back to the start. She was kind enough to give up her remaining food supplies to us as these weren’t needed and we had the unexpected bonus of some chocolate mice and salted peanuts. These came in handy later as Stouty started to cramp up as we hit the next long gradual incline and the salt content in the peanuts must have worked wonders as we got back into a running groove following this ascent. The rest of the race was simply a question of ticking off the miles. We managed to run the majority of the downhill section towards Pencelli and back onto the canal although the run was punctuated with short walking breaks before we trotted on. We didn’t really see a lot of people around us. A small number of people passed us at certain points and we overtook one or two people but we didn’t really see any groups of people ahead or behind us at all just the odd sporadic runner. Physically, I felt ok. The sole of my right foot felt bruised and sore (perhaps from the stony ground). I was a little concerned my quads would be suffering from the constant attempt to slow yourself down on the hill but they didn’t feel too bad. In all honesty, I felt much better than I had a month ago running a PB effort at the Abingdon Marathon (which had felt like a struggle at mile 20) so the frequent walk breaks did give you a chance to relax some muscles I guess. It was just starting to get a little darker although we knew we would finish before we needed our head torches which was a great boost. Minutes later we spotted the lights at Henderson Hall and jogged the last few hundred yards of the canal path towards the finish where we were greeted by the enthusiastic Sue at the finish line. I forgot to stop my Garmin until a few minutes later but the time would have been just over 9 hours. Colin had finished about 10-15 minutes ahead of us. We picked up the Brecons T-Shirt (no medal I’m afraid…) and went inside the get a nice cup of sugary tea before sitting down and speaking to some of the other finishers. (Quick hello to Neil / Beardy). There were shower facilities in the hall and we showered and changed before heading back down the M4 and home that evening. I missed the presentation ceremony as I was in the shower but heard the winner completed the event in an amazing time of under 6 ½ hours. We both enjoyed the event overall, it was good fun. We were fortunate with the weather this year as it could have been a lot worse. The terrain was not as tough as I had expected although Tor y Foel summit was tough second time around. In fact the footing was probably the more challenging aspect as some of this was pretty tricky to run along and a light step was required. We were fortunate enough to finish in the light and as we were leaving could see people finishing in the dark with head torches on and some of the route would have been pretty challenging in the dark. However, the cut off time of 15 hours is pretty generous. Thanks to Martin & Sue for putting on the event.